Not too shabby this month, woohoo! This Is Our Story by Ashley Elston: SO GOOD. The Way Back to You by Michelle Andreani and Mindi Scott: Ooh, I really, really liked this! Bad Blood by Jennifer Lynn Barnes: I did not give this series permission to end. By Your Side by Kasie West: This had...issues. The Things They Carried by Tim O'Brien: Such an understated but fantastic book. The Bone Season by Samantha Shannon: Not sure why this is so hyped? An Ember in the Ashes by Sabaa Tahir: Again with the hype. A Torch Against the Night by Sabaa Tahir: This sequel was not an improvement. Graffiti Moon by Cath Crowley: This had potential, but the writing's a bit of a bust. 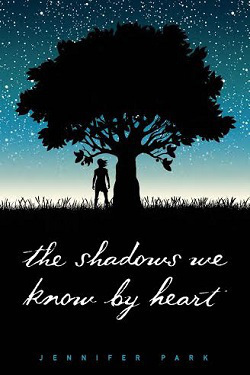 The Shadows We Know by Heart by Jennifer Park: SASQUATCH. I wasn't quite sure which book to put here--it's probably a tie with Chimera--but it came down to which book I'd be most likely to reread, and The Shadows We Know by Heart won. I just really, really liked this book and I devoured it, okay? It's filled with Sasquatch, but it's so, so far from being ridiculous. Featuring a special furry guest! I posted my recent TBR additions and ten bookish things I'm thankful for. Waiting on Wednesday brought about one of my most anticipated books of 2017 and some serious cover love. Two new episodes of Ninety Second Novel this month: By Your Side and The Shadows We Know by Heart! Last but not least, I discussed my blogging secret and my reading mistake. I'm technically in the middle of a million books, but right now my focus is solely on Sarah Beth Durst's Ice (which I'm really liking). Whatever I read is based on my mood, but I'm trying to just read as much as possible and do so quickly so that I can reach my Goodreads goal. And there are certain books I want to read before the year is over, so I'm hoping to read those too! I can't think of many new songs I'd on repeat (except for Sia's version of "Satisfied") but CHRISTMAS MUSIC. I hope you had a happy (food- and shopping-filled) Thanksgiving!